Next up on the inspirNational Music playlist is Renegades by the X Ambassadors. While I have listened to this song over the past several months, it was not until this week that I watched the music video on YouTube. I was very inspired by the song’s lyrics, as they remind us to fight through life’s challenges. 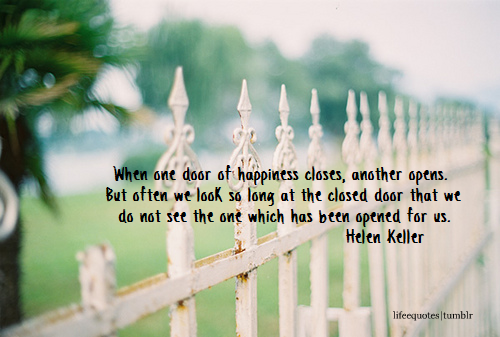 And rather than viewing our lives as a series of challenges, viewing them as opportunities. The music video begins with a dialogue of a blind woman and man. The man describes that when facing life’s challenges, “It’s not a matter of enjoying [life] more or less. It’s about enjoying it differently. It’s enjoying it through a different vision. Through another lens.” I’m reminded of the famous quote that “You can’t always change your circumstances, but you can change your attitude.” As we take on the week ahead, I hope that we can all remember to enjoy life no matter what we face each day. Carpe Diem! Give the gift of exploration. Plan a trip to explore a new place, near or far, with your loved ones. LivingSocial and GroupOn consistently post great excursions and adventures near you. Hotels often offer holiday packagaes and airBnB provides affordable lodging options throughout the world. Exploring will bring you new insights and memories you will never forget! Give the gift of creativity. Especially if you have been craving arts and crafts, make an art creation for your loved ones. Paint a picture, design a scrapbook (Apple has great digital scrapbooks you can make! ), or make a blanket! 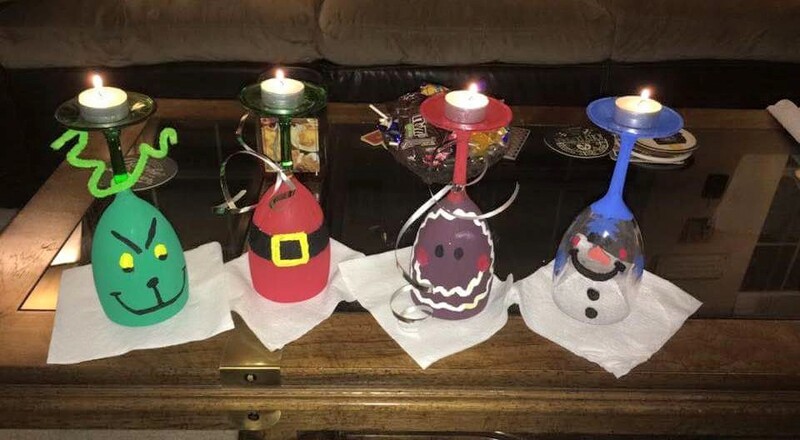 I enjoyed painting wine glasses-turned-candle holders for my family this year. You can also purchase art class subscriptions, such as wine and painting classes, to encourage your loved ones to be creative as well. Give the gift of homemade cuisine. I have loved the trend of recipes and ingredients sent to your door, making home-cooked meals much easier than ever before! There are also great custom wine deliveries, snack deliveries, and pet food deliveries, that make a “staycation” possible, customizable, and fun! Give the gift of reflection. Purchase yoga or meditation classes to help your loved ones relax and reflect as they enter the new year. There are also reflection books, such as The Five Book, which help you think about your vision for your future that will make you that happiest version of yourself. What other inspirNational gift ideas do you have? No matter where we are, we can live with this mindset, which helps us live life to the fullest and make the most of any situation. Another way to think about being inspirNational is through cultural intelligence. 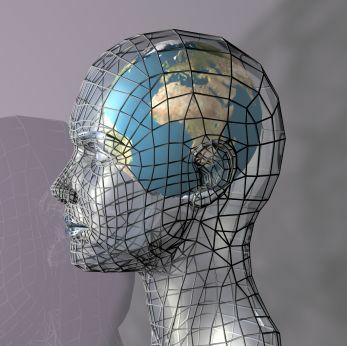 Many of us understand general intelligence (IQ) and emotional intelligence (EQ), but cultural intelligence (CQ) has only recently been studied and interpreted (since 2003!). Studying international business has provided me with an interesting perspective about cultural intelligence and its significance in my international business career. What is cultural intelligence? It is the ability to work with people who are not like you. It is the willingness to think broader than your individual, familial, and local norms. Many people assume that cultural intelligence comes from understanding others’ cultures. The most difficult culture to understand, however, is your own. It is important to learn when your own culture helps you and when it hurts you. Develop cultural understanding of your own biases and what opportunities become available in your life as a result of your background and worldly knowledge. How do you develop cultural intelligence? Think about your core: your qualities, values and beliefs that define who you are and are non-negotiable. For example, my personal integrity, work ethic, and commitment to health and happiness are core to who I am. Then think about the components of your life that are flexible. For example, my clothing and where I live is flexible.The flexible components are where you can develop cultural intelligence. Consider learning from other cultures about how you can improve your lifestyle. While living in Spain, I learned how a laid back lifestyle helped me be more productive and healthy. Traveling throughout the world has enabled me to have a wardrobe and jewelry that always tell a story about my adventures. I am passionate about developing cultural intelligence and it is one of my lifelong pursuits in my daily experiences. By becoming culturally intelligent, you are opening yourself up to a world of opportunities. You will become self-aware of your own biases and how they affect your daily decisions and behaviors. You will find it easier to connect with others throughout the world. You will be able to listen, understand, and appreciate the diversity of the world. You will have a competitive edge in both your personal and professional life. Want to learn more? Check out this fascinating Tedx video about cultural intelligence by Julia Middleton. How have you developed cultural intelligence? Have you noticed any advantages or disadvantages of being culturally interested and aware? With exactly one year since I traveled to Hawaii, I can’t help but reflect on how that vacation has impacted me over the past year. Relaxing on the beautiful Big Island was one of my favorite summer vacations, as it gave me time to reflect on my future. 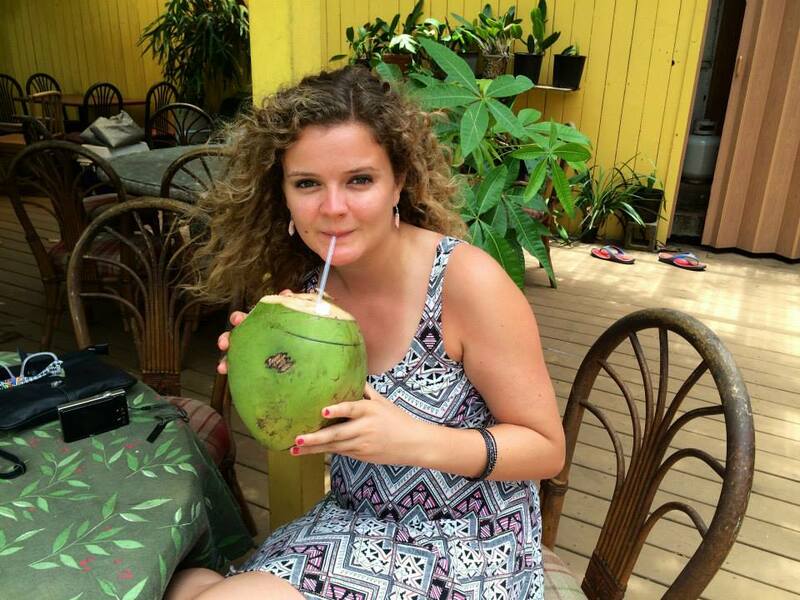 While laying on a hammock, sipping a fresh coconut, I thought about how exciting it was that I would be moving into my first apartment by myself for a year of self-discovery in Cleveland. I was ready to create my vision for the future, including role models who would help guide me in my intended path. I was eager to experience my first long distance relationship. And believe it or not, with a little notebook I brought with me, I first started brainstorming ideas for this blog. I decided to create inspirNational to help others find international inspiration in their everyday lives. Looking back, it is amazing to think how a small break from my daily life (surrounded by volcanoes and the ocean breeze in Hawaii) prepared me for one of the most transformative years of my life. 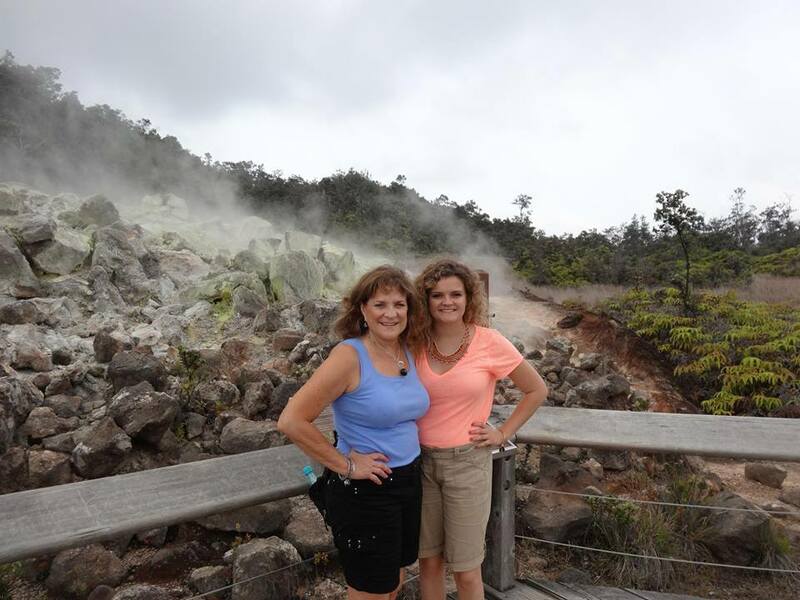 At the Hawai’i Volcanoes National Park with my mom! Flash forward to now, I completed my first year living by myself, with milestones including writing this blog with features on Pink Pangea and One World 365, establishing my vision for the future, learning how to cook, advancing my yoga practice with crow pose and headstands, applying to and starting the top international business graduate program, and moving to a new part of the United States! I am reminded of the importance of summer vacations and taking time to reflect, whether that means camping in our own backyard, traveling to a nearby city, or flying overseas. What makes a difference for me on vacations is to truly disconnect from everything I know, meaning no internet access, no phone calls, and no work. With a clear mind, we are able to listen to both our minds and our hearts. We can quickly do a “pulse check,” making sure that we are content with our status in life and improving different areas as we see fit. With this true disconnect, we can reconnect with the world after our vacation with a refreshed attitude and positive perspective to keep growing as individuals. I hope that we all have had (or will have) time this summer to go on vacation. We all need and deserve time to be inspirNational and relax. Happy reflecting on your next vacation! One of my favorite things to do before I move or begin a new life phase is create a bucket list. A bucket list outlines the most significant activities I would like to do and places I would like to go. I have moved every year since age 18, which makes me feel like an expert in creating bucket lists. In fact, my inspirNational mindset of living life to the fullest and seeking opportunities has been the exact mindset I have needed to create bucket lists. Write down your bucket list and constantly review it. By writing your ideas, you are helping commit them to memory and making your dreams turn into reality. It is also satisfying to be able to cross items off your list as you complete them. Create a calendar. What timeline do you have to complete your bucket list? The calendar will help you organize the bucket list events and make the process seem less overwhelming to do everything you would like. Prioritize your bucket list ideas. Consider dividing them into what you “must” do before you move or begin a new life phase and what you would like to do if you have time. Target different areas of your life. I often find that my bucket lists involve restaurants. Since it is not realistic for me to go out for multiple meals every day, I have made sure to include other activities besides eating, such as attending concerts or running in parks. Be open minded to new ideas and events. Planning your bucket list ahead of time is helpful, but there may be new “real-time” opportunities that you cannot plan. By allowing spontaneity, you may be surprised by the enjoyable experiences you will have. 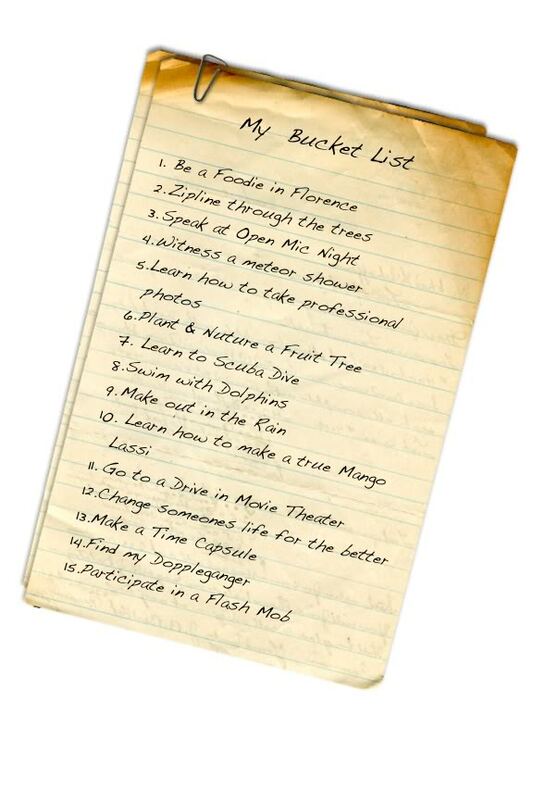 What other tips do you have for creating a bucket list?